I had dwindling hopes of selling my house after being on the market with other REALTORS®. But The Gary and Nikki Team displayed an unrelenting drive to sell my house at an acceptable price in a declining market. I congratulate them. Given the state of the housing market today, we’re sorry we didn’t use The Gary & Nikki Team sooner. We are sure we could have sold our house in less time! The Gary & Nikki Team have sold FOUR of our properties over many years. The service and professional attitude of all the real estate staff at Keller Williams is always superior. Customer contact is personal and comprehensive. We recommend The Gary & Nikki Team with Keller Williams Realty to all our family, friends and work associates. With all our possessions in storage and living in in temp housing we have not had time to reflect on the past 3 months but I wanted to thank you and your team for a fantastic job. Don was always “Johnny on the spot” for everything. The entire process went exactly as described by Don in our first meeting and we were glad we choose your company. Kudos to the Gary and Nikki team! I have to say I am really impressed with Keller Williams, Gary and Dominic. I feel everyone treats us as if my home were the only home to sell. Your company is very large but we are treated like family. Thank you and special thanks to Gary. Dear Bob, I’m so excited I can hardly function, but it’s a great feeling. I tell everyone what a fabulous job you and Tom have done for me. Yesterday, I handed out one of Tom’s cards, and I wrote your name on the back as the Closing Manager. “This is the team you want!” said I, and I meant it. And yes, I’ve had many naysayers put this extra service and attention down to the real estate market being bad, and agents being hungry, but I don’t believe that. The market in Connecticut is almost as bad, and my agent didn’t do anything except list the house and collect her commission at the closing! So, next January, I’ll be parked on the doorstep of the Pasco County offices with my closing papers in hand!!! By that time, I’ll have new A/C and a tankless water system installed, and a rainwater reclamation system in place, rooms painted, music playing, and more paintings in progress. Life is pretty good now, but it’s just about to get much, much better. After our initial dealings with other companies, we felt it would be impossible to renew our faith in Realtors. We were wrong. Professionalism at every turn made us “raving fans” of The Gary and Nikki Team. We also feel that we can tell our friends who will have homes to sell or buy to use the Team – with utmost confidence. – Buyer: Camille & Frank S.
I was gratified when the sale of my house and the purchase of my condo came together perfectly. The closing was quick, easy and pleasant all around. I certainly can truthfully recommend the Team to anyone. The Gary and Nikki Team including the entire staff by far exceeded our expectations of what buying and selling a house should be. Everything from A-Z was completely flawless!! Most of the other Realtors should definitely look them up for lessons in Realty! – Seller: Nick and Andrea T.
I thought “The Team” concept worked well with me when I purchased my home. From the Buyer Specialist to the closing process everyone was great! Professional, courteous, on time service. What more can you ask for when purchasing a home? We tried another agent for 2 and a half months who did a very poor job marketing our home…we listed with the Gary and Nikki Team and the house sold in 5 days for the price we wanted! We would use them again! I thought the marketing was a plus, as it turned out, our home sold in less than 48 hours! Thanks so much! After an unsuccessful listing with another agent, we selected The Gary and Nikki Team…they did an excellent job in a professional manner in meeting our objectives in relation to the marketing, sales price, and closing of our home within a 90 day period. Thanks for you much appreciated help in selling my Florida home…the thought of dealing with our sale at such a distance was quite daunting but The Gary and Nikki Team made it easy! As a real estate broker/owner from another state, purchasing our second home, we know more than anyone how a transaction should be handled. Our Buyer Specialist did an awesome job finding us our new home… and the closing department made the whole transaction go extremely smooth. Thanks again for all the help, you guys are awesome! – Buyer: Jerry & Jessica G.
You are the best! I will recommend you without reservation to anybody I know that will be buying or selling. I have experienced the Gary and Nikki Team effort in selling TWO of our homes. They are so aggressive in expediting getting the house on the market, that it sold within ten days! Working with our Buyer Specialist was a wonderful experience! Would definitely use again. – Buyer: Eric & Amy S.
It simply does not get any better than you guys! “I hit the internet searching for realtors and called quite a few. Some never returned my call, others did and didn’t take me seriously. “When it was time to turn us over to Paul Dugan, I was immediately uncomfortable. I had grown to trust Tom and did not want to deal with another person. Tom and Paul both reassured me that Tom would not disappear and I would be well taken care off. I was, again beyond my expectations. Closing team – If possible, Paul took our experience with your firm to an even higher level. He was on top of everything and when others didn’t meet his expectations of service…he was on it immediately. I truly felt as if Paul was my partner, managing our costs as if they were his own. My husband and I were extremely satisfied with the professionalism and manner of The Gary & Nikki Team. Their marketing tools are exceptional as is their communication and reports. But the proof is in the end results. Our home was listed for 15 month with 2 other REALTORS®. The Team sold our home in 3 months. Kudos especially to their closing manager, who held my hand during the whole process. With The Team, you will deal with people, not robots. Thanks to all! The amount of effort put forward by the entire Team was phenomenal during a very difficult process. I would also like to give special recommendation to The Closing Specialist who worked continuously and professionally throughout the negotiations and constant dealings with my lender. Without their tenacious attitude throughout the process the closing would more than likely not have happened. Thanks to you all for your outstanding work. The Buyer Specialist was awesome, attentive and responded to our comments about homes we liked and disliked. A smooth and efficient process. Would use The Team again. 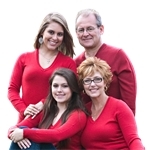 -Rodney D. and Heather N.
A pleasure working with your professional Team. We will miss Florida after 25 years, but will enjoy Tennessee. The amount of effort put forward by the entire Team was phenomenal during a very difficult process. I would also like to give special recommendation to The Closing Specialist who worked continuously and professional throughout the negotiations and constant dealings with my lender. Without his tenacious attitude throughout the process the closing would more than likely not have happened. Thanks to you all for your outstanding work. 100% Happy. Worked well with me from out of state. Showed me what I asked for and did not push for a sale. The Team was very professional and at the same time very caring. My neighbors were all impressed with the activity generated and the short time on the market before getting a contract. I have referred The Team to others including two neighbors! I got lucky! Retaining the services of a real estate Team to sell our home when we live out of state is a guessing game at best! Finding The Gary & Nikki Team was a blessing in disguise. Sure, we expected to sell, but the communication, patience and being very honest and upfront is worth it’s weight in gold. No matter if buying or selling a home if you do not use The Team you are missing the boat! They are very professional and do the best job they can to get you satisfied. Recommend them as the REALTOR® you can trust! – Virgil & Susan V.
I have bought and sold 6 homes and NEVER had such good, professional service! Keep doing what you are doing. Your Team is SUPERIOR in EVERY way. You guys could write a manual as to how to get it right. Good job!